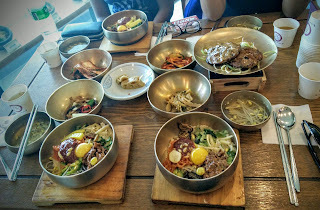 Even after another long week of classes, it didn't stop me from planning another trip out of the city--this time it was to Jeonju, the region in Korea well-known for its bibimbap. 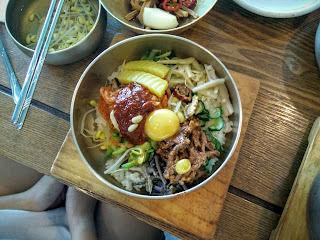 One of the dishes that is immediately recommended to foreigners in Korea is bibimbap, which is a mixed rice dish topped with assorted vegetables, occasionally meat and shredded eggs, and a spicy sauce. 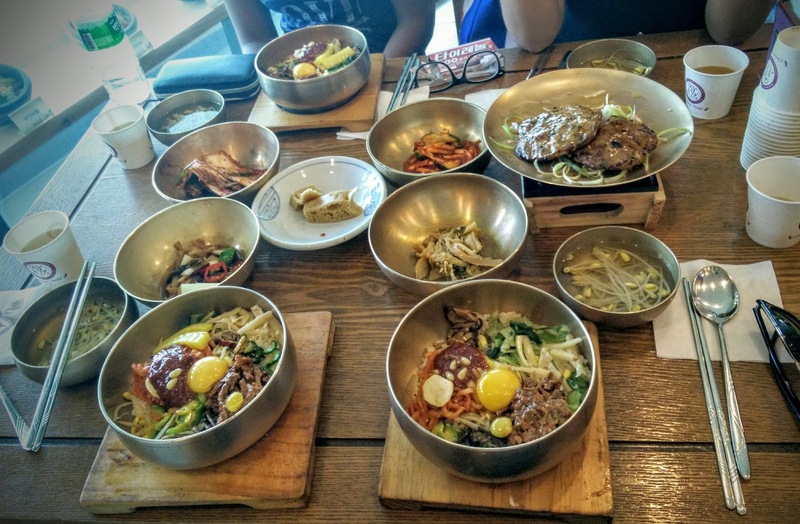 I wanted to eat at Gogung, which was a restaurant originating from Jeonju that specializes in traditional Korean food, especially bibimbap. We reserved the shuttle bus from Seoul to Jeonju that would leave in the day and return at night. The bus dropped us off near the cultural village where there were many cafes and restaurants. It was common to see people passing by dressed in Hanboks, Korea's traditional clothing, because there were also many Hanbok rental shops, similar to ones in Insadong, Seoul. To get to Gogung, we had to take a bus after passing the cultural village. The restaurant was well decorated and had an oriental atmosphere. 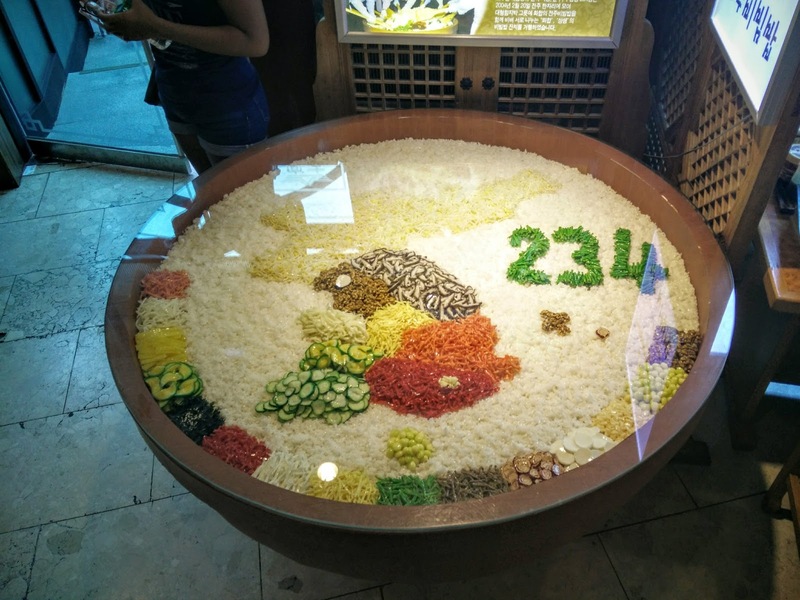 On the 2nd floor near the restrooms was a small area that was an museum in itself with displays of the ingredients used to make the rice dish along with the history of the dish. Overall, the meat was very good, and I would definitely recommend this restaurant for anyone who visits Jeonju and wants to try authentic Korean dishes. We also stopped by Duimo, which was a small restaurant in the midst of a mural village. This spot was featured on a Korean cooking show where the hosts invite chefs from local restaurants (hole-in-the-wall type of locations) to compete to see which dish is "better." At Duimo, they serve a twist on the classic bibimbap by turning it into something more modern--a bibimbap waffle. The waffle itself is made from the rice mixed with a bit of the spicy sauce, and the toppings on a bibimbap are wrapped in the waffle like a burrito. 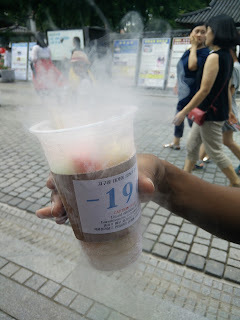 It was a very interesting fusion take on a traditional dish. We only had a bit of time after to explore the mural village--there were many cartoon drawings such as ones of Ghibli Dtudios, that creates famous Japanese animation films such as Spirited Away, Totoro, Howl's Moving Castle, etc. 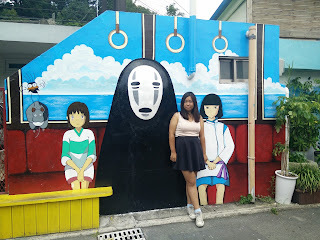 Of course, I stopped to take a few pictures with the mural before moving on. We also found a stand that sold "Dragon's Breath," which was puffed cereal that was filled with nitrogen gas. 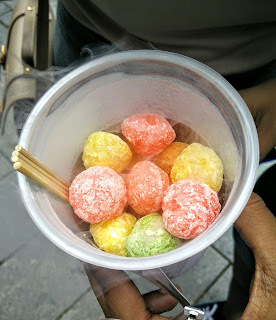 When you chewed the snack, puffs of gas would also come out of your mouth. 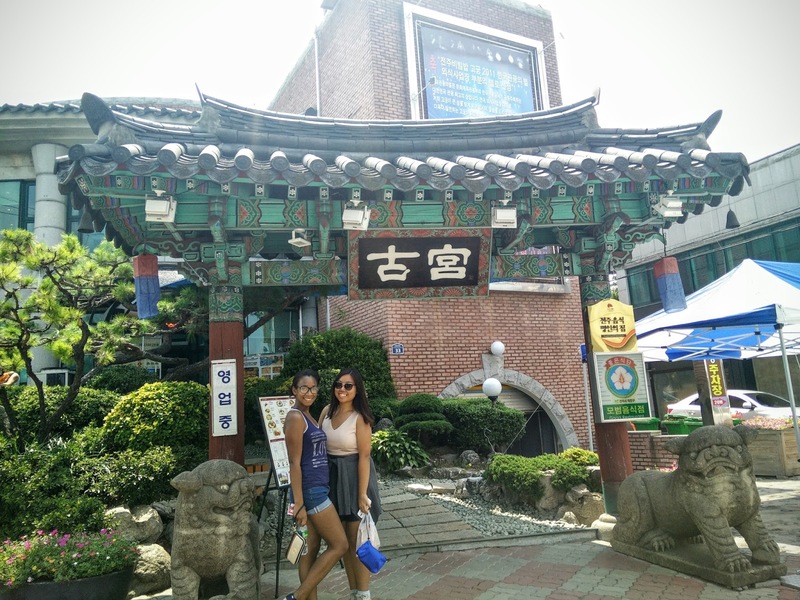 Unfortunately, we didn't have much time to explore Jeonju more because by the time we walked around and took the public buses to and from the restaurants and filled up our stomachs, it was already time to get back to the bus and head back to Seoul.